All siding systems require regular maintenance. While some require more maintenance than others, any promise that a particular product is maintenance-free should be regarded as not completely truthful. One of the most common ways of siding maintenance if painting. Some homeowners re-paint the exterior of their home every few years only to find that the new paint does not last, others find that their siding has failed and that they need a new sidings system.The importance of siding design, material selection, installation practices and maintenance practices can’t be overstated. Siding must perform a number of vital functions, including the protection from sun, wind, rain and moisture. It must also cope with moisture that emanates from the interior of the house. Premature paint deterioration is often the result of moisture and water vapor, which originates inside the home and penetrates through the wall and siding. For example, one of the most common ways to detect failing tub and shower walls is by the appearance of blistering and other paint deterioration at the outside of the wall in question. Such exterior paint damage cannot be corrected by any exterior painting process unless the cause of the moisture or water vapor is first eliminated and associated repairs are made. Poor quality painting is counterproductive. A good exterior paint job should last 10-15 years. Vinyl siding was introduced in the 1950s and since then, has been sold as an exterior option that never needs updating. But while vinyl siding does fade more slowly than exterior paint and is less susceptible to the damaging effects of Midwestern weather, it will fade and sustain damage over time. Eventually, the homeowner who thought vinyl was the ultimate ‘install it and forget about it’ option is going to see his or her home’s exterior paint looking increasingly tired and dull. Replacing old vinyl siding is expensive and not always necessary. Many clients ask us whether painting vinyl siding is an option and the short answer is “yes.” The procedure is even pretty straightforward when compared to painting a wood exterior. Old vinyl siding is prepped before painting, often with a thorough pressure washing and, when necessary, a second wash with a cleaning solution designed to remove mold, moss, and mildew so it won’t return. Newer vinyl siding may not need as detailed a cleaning, but paint will always adhere best to a dirt-free surface. A good rinse is especially important because leftover soap residues can prevent paint from really sticking. The number one reason people caution against painting vinyl siding is that vinyl expands and contracts much more significantly than other materials as temperature changes. That means that in addition to changing size and shape as winter gives way to spring, vinyl siding also grows and shrinks throughout the day as it is exposed to sun and shade, and when the sun goes down. As a consequence, standard acrylic latex paints don’t bond well with vinyl and under certain conditions, painted vinyl can even warp. So when painting vinyl siding, it’s important to choose a high-grade paint designed to expand and contract along with the siding. Some paints, in particular those containing urethane, work great on vinyl siding as long as you choose an exterior paint color that’s lighter than the color of the vinyl siding itself to prevent flaking paint and warping vinyl. But if you have your heart set on a darker color, you’re in luck. New vinyl safe paint tints from various manufacturers feature darker colors designed specifically to withstand the expansion and contraction of vinyl when used with specific bases. 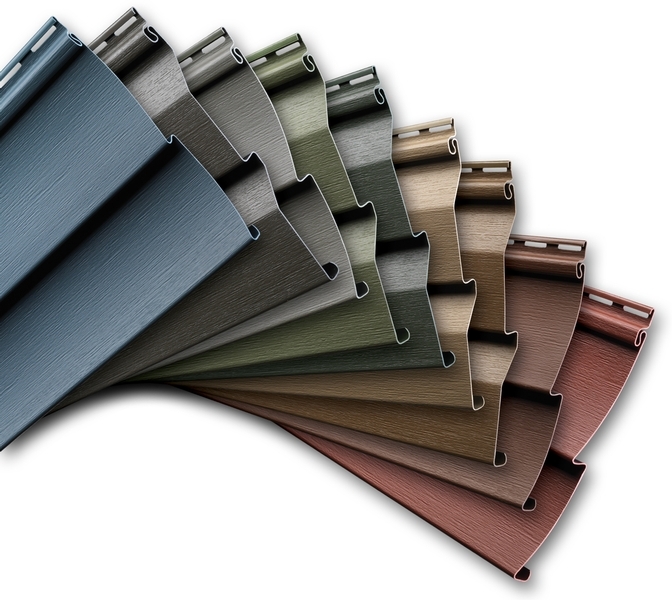 You won’t find every color under the rainbow available in these new specialty formulations designed for painting vinyl siding, but you will find a much greater variation of hues than you would have, say, two years ago. And if you choose your exterior paint products carefully, especially in this particular instance, your vinyl siding colors will stand up to even the worst conditions of the harshest Chicago winter.